The past couple of years have seen a surge in mobile phone usage. Smartphones are becoming more and more advanced, now containing highly addictive apps for texting, shopping, online gaming and social networking. 93% of adults own or personally use a smartphone in the UK (Ofcom). Many of whom can’t resist the compulsion to reach for their phones several times a day, often making it the first thing they do in the morning and the last thing at night, ignoring loved ones in the process. Modern advances are regularly criticised by old fashioned technophobes, but it is time to be honest with ourselves. It is time to see that smartphone usage can be addictive and it is becoming an epidemic. You only need to step on a train to see that public transport now consists of lifeless humans peering down, staring at their phones. Passengers rarely talk, and if they did, their phone would be firmly in their hand ready to check during any slight gap in conversation. That is, if they are even aware that they are being spoken to in the first place. The fact that there is now a need for digital detox retreats, where people go away to areas of the country that is completely without signal, or smart phone jails, where we lock our phones away in a plastic jail with a timer on them, highlights the clear addictive qualities of smartphone usage. People have become obsessed with staying up to date with current news or gossip but in reality, many people who return from their detox retreats say that after their break from social media, they realise that they didn’t miss much at all. Dr Andrew states how, “Relationships suffer with people who are not present for each other”. People can become preoccupied with the false, airbrushed worlds of Facebook or Instagram instead of concentrating on their important, real issues and relationships. Using smartphones could be seen in Psychology as an avoidance strategy, which helps relieve social awkwardness or anxiety, but in reality prevents people from combatting their issues head-on. Our society’s children and teenagers are a generation under extreme pressure to conform to this increasingly complex online domain, leading to feelings of inferiority and self-esteem issues. A recent study by Samaha and Hawi (2016) showed that among 300 university students, those who were more addicted to their phones tended to experience higher levels of perceived stress. They also found that students at high risk of smartphone addiction performed less well academically. So what can we all do? As with any addiction it is important to accept that there is a problem. Each individual is different in how their smartphone use affects them, and going “cold turkey” may not be the best way. A lot of people returning from their digital detox retreats find that they relapse as soon as their phone detects a signal again. So perhaps the best way to help ourselves, is to put a time limit on each app that we use, or to gradually reduce the time spent online by giving ourselves time in the day without our phone nearby. We should show ourselves that there are other, more important things in life and that talking face-to-face with people is much more fun than staring down at a bright screen. Overall, smartphones have lots to offer, but when overused they can reduce our quality of life. An important thing to remember is about educating our children. Help them understand that talking to friends online and posting pictures of their meal that day isn’t the be-all and end-all. Even better, through our behaviour, let’s model healthy smartphone use to them. Let’s appreciate the body language and social interaction skills that we were born with and have developed through our lifetimes! Let’s educate, be aware, spot the signs and help each other to see how colourful life can be without smartphones. 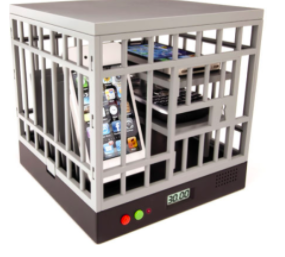 Better still, let’s lock our phones away in a smart phone jail (even just temporarily) and just talk to each other.